Sin Ming Plaza is a high rise freehold condominium located at Sin Ming Road, off Upper Thomson Road. It consists of 102 exclusive 2-4 bedrooms apartments. Sin Ming Plaza is a stone's throw from amenities like shops, clinics, restaurants along Upper Thomson Road and Thomson Plaza. Sin Ming Plaza and Thomson Plaza mall is only 5-minutes walk away. Good schools like the Raffles Institution, Raffles Junior College, Catholic High School are within 5-minutes drive. MacRitchie Reservoir Park, Bishan Park are also nearby for nature lovers. The up-coming Marymount MRT Station (Circle Line) will be within short walking distance to Sin Ming Plaza. Sin Ming Plaza is accessible via the nearby Central Expressway (CTE), Pan Island Expressway (PIE) to various parts of Singapore. Driving to the Business District takes about 20 minutes. Well located project. Awesome choice! Quiet place with rustic charms. Interior so spacious, hardly found in other condos. 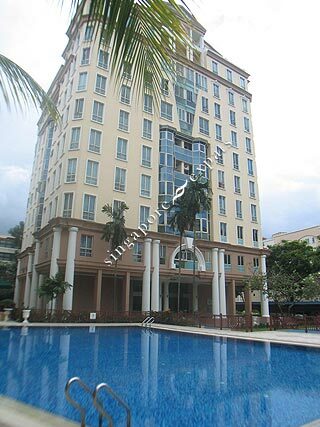 Convenient with nearby MRT and many bus services. Sin Ming Plaza is located a short drive from several schools including the elite Raffles Institution. There are also numerous eateries located along the stretch of Upper Thomson Road and Sin Ming Road, just a short walk from the development. The Macritchie Reservoir Park, Thomson Plaza, and Bishan Junction 8 shopping mall are all located in the vicinity. Residents can get a host of amenities at the aforementioned malls, such as supermarkets, restaurants and eating establishments, cinema, library, boutique shops, and banks. In addition, Mount Alvernia Hospital is just a short drive away. For vehicle owners, driving from Sin Ming Plaza to the business hub takes 15 minutes via Central Expressway, whereas the vibrant Orchard Road shopping district is slightly more than a 5-minute drive along Thomson Road.